I’ve been re-reading a lot of 亦舒‘s (Yi Shu) books lately, thanks to the free download on iPad. Though she has published over 180 books including novels and short stories of different genres, she writes mainly romance novels, set in modern day Hong Kong, or Canada (she has migrated there). Most of the main characters under her pen, are strong willed, independent career women. They often are appreciators of food and not afraid to eat (and are never fat). Hence there’s no surprise that food is often mentioned. Last week I was inspired to make the traditional Egg dumplings (蛋饺), one of the common Hong Kong dishes, though yet to perfect it. This week, the soup that often appears in her books, the Borscht (罗宋汤). The Hong Kong style Borscht has been adapted from Russia some many years ago, ‘罗宋’ being a direct sonic translation of the word “Russia”. 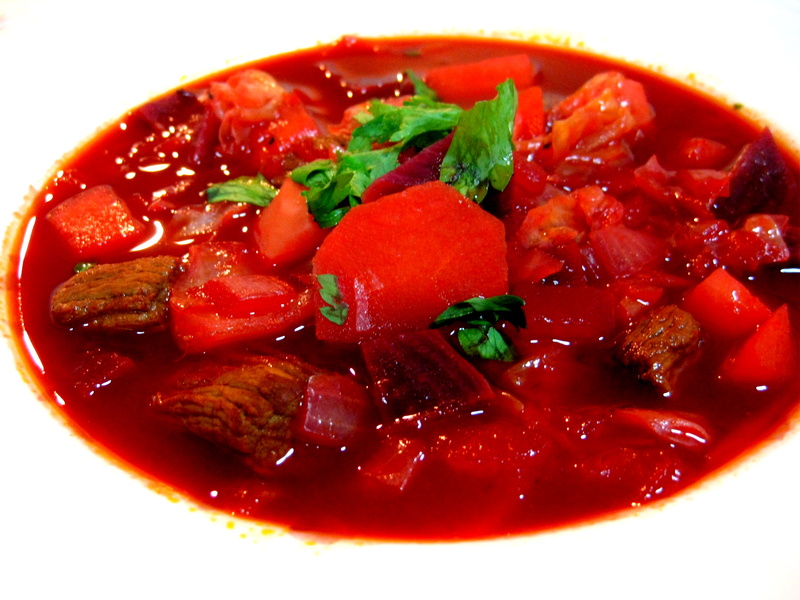 Their version uses tomatoes and beef as base whereas the traditional Ukrainian version contains beetroot, giving the soup a vibrant purplish red colour. Both Frank and I love beetroots, so there’s no surprise which version I chose to make. I’ve used a lean cut of beef and omitted the sour cream for a healthier version. We also prefer our vegetables in chunks while traditionally, vegetables are shredded like matchsticks. Brown the beef over medium-high heat, for a good 10 minutes or so. Remove from the heat and set aside. Fill a large pot halfway with water, and bring to a boil. Add the beef, and cover the pot. Return to a boil. Add the beets, and cook until they have lost their color. Add the carrots and potatoes, and cook until tender, about 15 minutes. Add the diced tomatoes, then the cabbage. Heat the oil in a skillet over medium heat. Add the onion, and cook until tender. Stir in the tomato paste and a little bit of the liquid from the soup until well mixed. Transfer to the pot and continue to cook for 10 mins or so. Add the raw garlic to the soup, cover and turn off the heat. Let stand for 5 minutes. Taste, and season with salt, pepper and vinegar. Ladle into serving bowls, and garnish with fresh parsley. You can enjoy the soup as is, or with bread. We did without the bread. But had seconds. My favourite bits were the tender cabbage, the sweet beetroot chunks and of course, the colour. We eat with our eyes too, after all. Time to get back to the books and hopefully I’ll get more inspirations while I’m at it. Anything with potato will always have my interest. So when you setting up your own restaurant? Have to decide on a cuisine first. But it will serve the best eggs Benedict in KL. All breads will be baked daily in same kitchen.